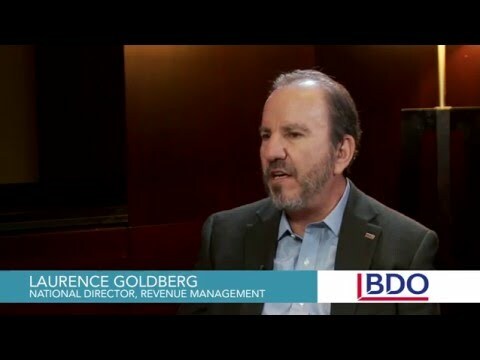 Laurence Goldberg, Director of Revenue Management for BDO USA, has seen some of the interesting dynamics associated with a company experiencing exponential growth—like a resulting new influx of data on a daily basis. But it’s not just about managing the volume of data—it’s about using the data in an informed way. “It's understanding our clients, understanding what issues they're facing and how we can work with them to resolve their issues,” says Goldberg. “Plus, we need to ensure we’re managing the information from an internal perspective as well. It’s critical for us to understand ongoing client viability when making informed decisions,” he adds. Using an automated process driven by smart business information is part of BDO’s overall business intelligence; they use it on an ongoing basis to manage the business and minimize risk exposure. Goldberg shared with us more of what’s working well for him and his team at BDO. BDO USA is a professional services firm that provides assurance, tax, financial advisory and consulting services to a wide range of publicly traded and privately held companies. As Director of Revenue Management, I am primarily responsible for cash-in processes, such as customer set-ups, credit, billing and collections. What are your key priorities for the upcoming year? Over the past two to three years, BDO has experienced exponential growth, and today we are a billion dollar company. As a result of that growth, the volume of data we consume on a daily basis has also grown immensely. We’ve expanded into other markets within the U.S., which also means the number of clients we serve has grown. With that, it is imperative that we have a true understanding of our clients and their needs. Big data isn’t so much about volume, but rather extracting the most important insights from the data and using it to advance relationships. With that, we can better understand those relationships and the associated challenges, then help our partners and client-facing professionals make better decisions. How has your decision-making process evolved over the years? One of the first questions I ask when working with a third-party partner or vendor is, “Are you going to take the time to learn about my business and listen to me?” We've been partnering with D&B for 15 years, and in that time, they’ve made it a priority to understand our business and help us craft solutions to drive better decisions. As a professional services firm, we work with companies in all different industries and markets and face all kinds of economic conditions—and our partnership with Dun & Bradstreet has been an important factor in helping us navigate that terrain. Their data has become a single source for us, which has allowed us to automate our credit process. In fact, we’ve used DNBi alongside our own proprietary scoring models, which lets us see how the information stacks up not only internally, but externally in the business universe as well. With quick access to pertinent information, we can have more informed conversations with customers. How do you keep up with the growth when it comes to data? It’s really all about automation—having a solution in place that we can use to push out our data. We push credit scores out to all our client-facing professionals. Back in the old days, we’d receive data, download it into a spreadsheet and spend hours looking at it. But with this automated process, and help from D&B, we have access to more consumable, real-time information that we can easily parse and disseminate to more than six thousand employees, which we do via a dashboard through our ERP. That information is used strategically in a number of ways—from training and onboarding to an overall intelligence that we use to manage our business. We rely on that intelligence not only to be accurate, but timely and consumable. And it is. Can you give me an example of how you would use the scores to drive a business decision? We recently completed a study whereby we went back and looked at the customers whose businesses failed and were, therefore, unable to pay us. When we scored those accounts to see if they were accurately predictive, we found that nearly half of them were. With that information, perhaps we would have made different decisions and reduced our risk exposure. As we grow, if we can identify the likelihood of a business failing, we may be able to manage those relationships differently and make more informed business decisions with reduced risk. Moving forward, we’d like to provide our customer-facing professionals and partners with that value-added information. “When we help our partners and client-facing professionals manage the business side of the relationship, we reduce the risk to the firm,” said Goldberg. By integrating the data into their business processes, and sharing it with key parts of the organization, that’s exactly what BDO has been able to accomplish. At the end of the day, a solid handle on the volume of data, combined with smart use of the insights it creates, positions the firm to not only keep up with their explosive growth, but also play a key role driving it.